Based on reviews from 41,865 users. 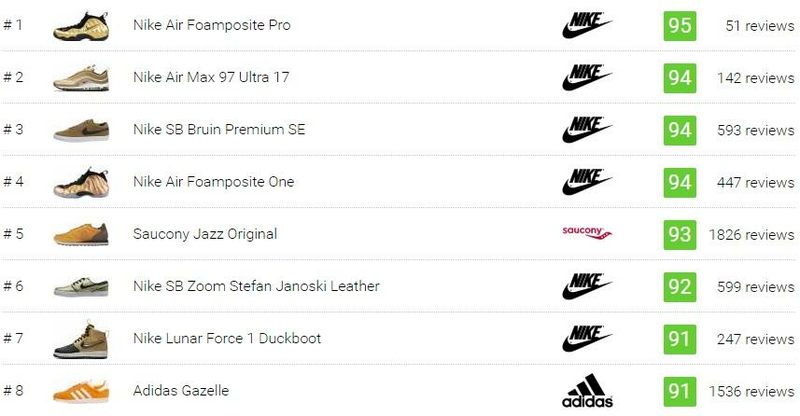 Learn how our rankings work or see our guide to gold sneakers. Updated Apr 2019. The colorway of a sneaker, at times, plays a big role in one’s style. The color of a shoe a person wears is one way of expression for the wearer’s feelings, mood, or method of relaying a message or making a point. Gold sneakers are one of the most attractive colorways as, in a way, it is unique and delivers an appeal that screams luxury and being prestigious. It adds more impact to one’s style as it often attracts attention with its brilliance. The element of the Gold in sneakers conveys definite self-expression, depending on the shade of the color is used on the silhouette, what other colors are combined or partnered with the color Gold, or how much part of the design is covered with the color. Take a little trip below to know more about gold sneakers and about the color Gold itself. Nike is one of the leading brands in the footwear industry. It has released a massive number of silhouettes in many categories, where some of which have become iconic sneakers. Nike has also been successful in terms of designing new silhouettes, updating, and making variations of their classic and iconic ones. A part of the 20th anniversary Nike Air Max 97, Nike freshened up the iconic silhouette. 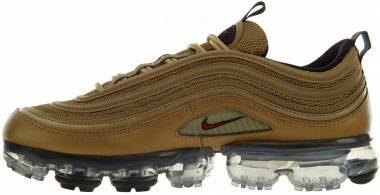 The Nike Air Max 97 Ultra 17 gold shoes feature an updated mesh and fused upper that is covered in a Metallic Gold colorway. A low-top skateboarding sneaker from Nike that is built with the low-profile Zoom Air unit in its heel, giving a lightweight cushioning as well as maximum protection for the foot with its internal fit system. The upper of this gold sneaker is covered with a suede material that offers durability and better ventilation, keeping the foot in proper comfort. The honeycomb midsole construction delivers extraordinary board feel. Its rubber outsole offers flexible along superb traction. First released in 1997 and was one of the signature shoes of Penny Hardaway. 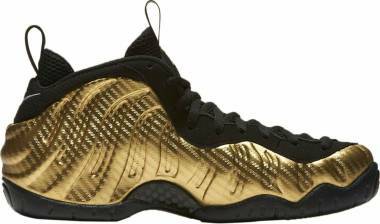 The Nike Air Foamposite One gold sneakers were one of the most expensive basketball sneakers during that time. The iconic silhouette features a seamless liquid Foam mold and its signature Zoom Air unit along with its carbon-fiber midfoot plate. A skateboarding sneaker that offers both style and performance. Leather and suede upper construction that provides durability and style. It sits atop a honeycomb midsole structure that delivers lightweight comfort and excellent board feel. 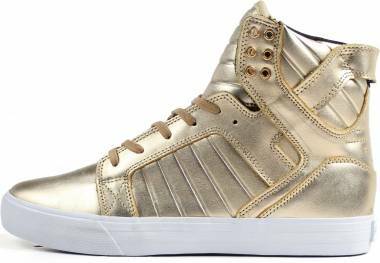 This high-top gold sneaker offers additional ankle support and protection. The waterproof Lunar Force 1 Duckboot delivers a soak-free performance and comes with wool lining that protects the foot from the wet weather. It also features the Lunarlon midsole and Air-sole unit which spreads the impact. The second coming of the Roshe from Nike displays a rather simple yet stylish design which is built with a bootie construction that offers a snug yet comfortable fit. 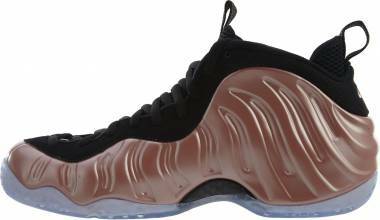 The Foamposite Pro Metallic gold sneakers is the luxurious version of the Foamposite Pro silhouette as a part of the 2017 holiday release of the brand. This Gold sneaker version of the iconic silhouette features the same design as its predecessor, the Nike Air Foamposite One, with only slight differences such as the side Swoosh and ditching the Penny Hardaway branding. Nike took its classic Air Huarache silhouette to the next level, covering it with a premium textile material finished off with hints of metallic gold accents. 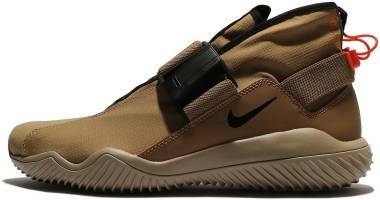 The Khaki suede covers most of its upper with green-tinged for inside on the neoprene bootie of the sneaker. This silhouette was created, taking inspiration from the sketches of the Air Max 1. 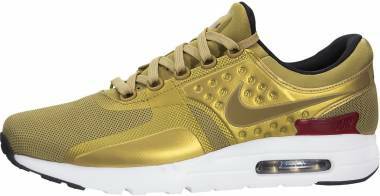 The Nike Air Max Zero QS gold sneakers then became a classic itself with its rich heritage and iconic, stylish design. Features the classic design of its original predecessor with some bits of updates on its silhouette. An open mesh upper construction provides ventilation for the foot with its synthetic leather overlays that deliver durability. 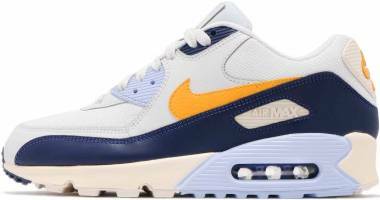 The Nike Air Max 90 Ultra 2.0 gold sneakers is finished off with its signature Visible Max Air unit and a rubber outsole pods for great traction. These gold shoes feature its traditional neoprene bootie with some little updates such as the dimpled foam effect that can be seen on the toe box of the sneaker that offers a luxurious style. Built with a mesh upper construction along with its neoprene sockliner that offers breathability, the Nike Air Presto Premium gold sneakers display a simple yet stylish design that is finished off with the brand’s iconic Swoosh branding embroidered on its sides. Featuring the Flyknit upper construction, the silhouette delivers lightweight comfort. 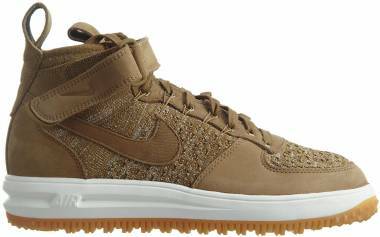 The Nike Lunar Force 1 Flyknit Workboot gold sneakers vitally fuse an Air Force 1 mid-top with the Lunar Flyknit Chukka upper. 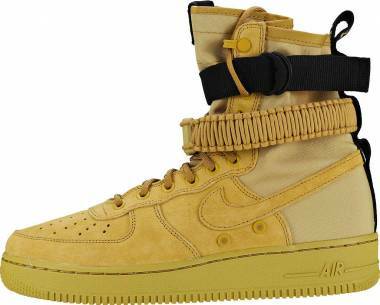 To top it all off, the sneaker features the nubuck overlays that give more durability, and the Dynamic Flywire support of the usual strap, tongue, and heel pull tabs of the Air Force 1 Mid. Adidas is a brand that holds a rich heritage with the backstory of its origins and how it was established. 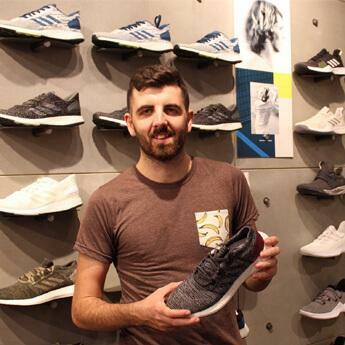 The Adidas brand has taken over the athletic footwear industry, and as it expanded, it swiftly made its way into the sneaker category with its silhouettes that had gained titles of being one of the most iconic shoes in history. The success of the brand also includes having silhouettes that became one of the best-selling sneakers. The low-top Swift Run from Adidas took inspiration from the 1980’s running silhouettes of the brand’s archive. Its notable and style-flexible design comes in a modern representation of the brand’s long-lasting design elements. The Adidas Swift Run gold sneakers display a full tonal Primeknit upper with a multi-colored yarn embroidery on its heel and vamp. A molded EVA midsole with the Torsion midfoot system finishes up the look, displaying the 80’s athletic design. The vintage Court Vantage tennis sneaker from Adidas is given a modern update for a more stylish appeal. The upper construction is covered in leather and a canvas lining. The OrthoLite sockliner provides great comfort and quality performance. The silhouette is finished off with a synthetic leather heel patch and a vulcanized look rubber outsole. The Pharrell Williams x Adidas Tennis Hu displays the classic Adidas heritage look with a breathable mesh upper construction finished up with a unique lacing system. An iconic and classic Adidas silhouette, the historically-famous Gazelle gold sneakers, showcases a pigskin nubuck upper structure with hints of synthetic linings and overlays along its heel. 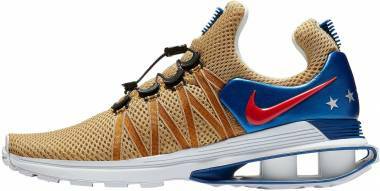 The tongue and collar of the sneaker are lightly cushioned for additional comfort. Finished off with the gold-foil Gazelle logo on the shoe’s side panels and the traditional Adidas logo on the heel patch and the tongue, the Adidas Gazelle offers a classic, versatile style. Representing the popular style of the 80’s, the Adidas Samoa features the toe-bumpers and the signature 3-stripes branding of Adidas. The shoe is built with a synthetic textured upper that offers classic style and excellent durability. The classic and iconic Adidas Superstar silhouette was given an upgrade with the brand’s boost technology which provides excellent energy response. The upper of the Adidas Superstar Boost gold sneakers are built with soft leather along with its remarkable shell toe. The design is finished off with the jagged 3-stripes traditional Adidas branding. Debuted around the late 1960’s to the early 1970’s the Adidas Superstar gold sneakers is a true classic from the brand. The shoe displays either textile or all-leather upper structure that provides maximum durability along with its traditional shell toe design which offers protection. Embodied by its signature cat logo, the Puma brand also started off by offering high-quality athletic footwear until it made its way into the sneaker industry. The brand has created multiple iconic silhouettes that have taken their own spot in the sneaker history and has made a solid name for themselves for being a part of the iconic classics. This iteration of the Puma Basket Classic displays the traditional round-toe, perforated detailing, and finished off with the metallic colorways. A variation of Puma’s iconic and classic sneaker, the Puma Clyde, which showcases a suede upper structure in a “classical core colors.” The low-top shoe also offers a rather comfortable, snug fit with its lace-up closure system. The signature Puma Formstrips graces its sides along with the Walt Clyde Frazier’s call-out on its lateral sides. A part of the Puma x Careaux collection which was given the feminine touch by the Netherland native graphic designer, Caroll Lynn. The round-toe, low-top gold sneakers display three adjustable straps that are being closed with the hook-and-loop, and its suede covered upper. It also features the gold foil Puma branding along with the Careaux logo on its perforated tongue. The signature Puma Formstrips on its side is also in perforated pattern. Another iteration of the Reebok Classic Leather in a gold colorway that its side and heel display a matte shimmer effect. This low-top shoe offers versatility and is great for both classic style and casual, everyday look. The Reebok Classic Leather Melted Metals features the timeless design of the Reebok Classic Leather in a metallic colorway that delivers a classy and sophisticated appeal. It also features the EVA midsole which offers great cushioning, and its leather-clad upper in metallic tone is a trendy tribute to its athletic heritage. A touch of the shiny, metallic appeal given to a classic silhouette, the Reebok Club C 85 Melted Metals displays a rather trendy look without failing to give respect to its heritage. Displays double-stitched canvas upper construction that offers durability. The Vans Atwood gold sneakers also feature the padded collar and tongue that gives off added comfort and the vulcanized sole and remarkable waffle rubber outsole for maximum traction. This silhouette is an introductory signature model for skateboarding rookie, Kyle Walker. The sneaker displays a canvas upper structure and features the UltraCrush HD impact sockliners that offer a great boardfeel and maximum impact protection. Inspired by the iconic Jordan Retro shoes, the Jordan True Flight gold shoes convey the Retro look that brings out an old-school vibe of the Air Jordan True Flight. Leather and Durabuck cover the upper. The Polyurethane footbed and flexible full-length Nike Air Sole unit give off a more comfortable feel as the Neoprene Dynamic Fit inner sleeve and nylon web pull loop offer great fit. This skateboarding brand has made a huge success in conquering the sneaker industry. It has garnered the favor of many skateboarding enthusiasts and sneakerheads. 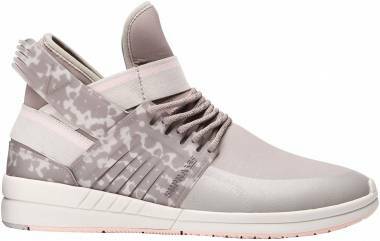 Supra continues its journey in the sneaker world with creating silhouettes that both provide quality performance and style. A reinforced upper construction and a new sole system is given to the classic Vaider silhouette which conveys a rather durable sneaker. 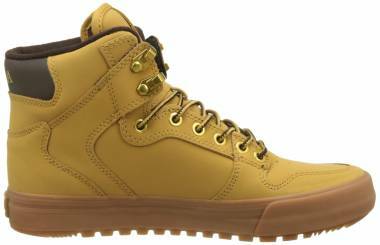 This high-top shoe offers maximum comfort and protection for the foot. 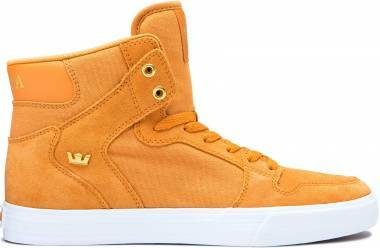 The multilayer sole is being introduced by the Supra Vaider Cold Weather gold sneaker. It offers the directional grip and traction for excellent performance. A classic silhouette from Saucony that displays a rather stylish design that offers both quality and performance. The Saucony Jazz Original also features a padded footbed, tongue, and collar that offers maximum shock absorption and which also provides a great fit. Converse is a brand that within its century-old existence remains relevant in both the sneaker industry and the fashion industry. With its most iconic silhouette, the Converse Chuck Taylor All Star, the brand offers a rich history of how the Chucks became an icon not just in basketball but in different sub-cultures as well. The silhouette has also conquered the fashion industry as it is one of the essential footwear in a lot of people’s wardrobe. This iconic silhouette features the lightweight and comfortable canvas upper and a rubber outsole for great traction. These gold sneakers offer the stylish metallic gold colorway that shines up one’s street-style look. The low-top version for the iconic Chuck Taylor All Star, these gold sneakers features a metallic canvas upper for lightweight comfort and durability. What does the color gold mean and what does it symbolize? Different colors express different meanings. One color can be defined through different meanings or interpretations in which sometimes depends on one’s perception. The color gold is being deciphered with a lot of expressions. It delivers different meanings on how it plays a role in a person’s life. European Flag – the flag displays 12 golden stars against the blue background in which the color gold implies balance and mysticism. It also conveys unity and cooperation amongst it countries. Representation and usage of gold in Christian Liturgical Aspect Fact: the Pope only allowed five colors in religious symbolism until the 12th century, and they were Violet, Red, Black, White, ad Green. After the ecumenical Liturgical Movement, Blue and Gold were added. Each of these colors signifies different meanings, and Gold symbolizes brightness of the day together with the color White. A color or shade of a color portrays different roles in people’s daily lives. Each shade of a certain color gives different effect in one’s state of mind and self-expression. It also affects our mood at certain times of the day. Sometimes one wears a certain color just because they simply like it and sometimes it has some personal connections to them. Each color shows significance in different aspects of one’s life. It wavers according to the influence of life circumstances and the impact of society. The color gold, as a prodigious version of the color Yellow, in psychology insinuates affluence and it also denotes “happiness versus bliss,” “shrewdness versus learning,” and “worth versus esteem,” which links to triumph that leads to a brain analysis that conjectures grandeur and material luxuries. What does it say when people wear gold sneakers? The color gold expresses self-confidence, personality, authority, charisma, and creativity. It basically applies on wearing gold sneakers as well as the color itself is something that not everyone is able to pull-off. Rocking gold sneakers display the unique and at the same time fun side of the wearer. The color also lets the wearer gain respect and attention. Is it worth to buy gold shoes? Are gold-colored shoes a good choice as a finish for a casual, street-style look? Yes, they are. The street-style look is a wide and versatile category when it comes to fashion. It gives the person the freedom to experiment with their outfits and explore more into the style. Wearing gold sneakers as a finish for a street-style outfit is a bold move yet an appealing one as it shows the creative side of the wearer. The bold, striking, and attractive appearance of the gold sneakers catches attention easily. Anyone can rock the shoe, matching it up with the appropriate ensemble, along with their confidence and brave style. 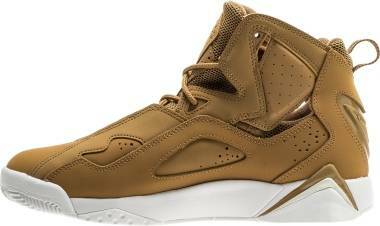 What kind of upper materials are best for gold lifestyle kicks to make these sneakers last long? The longevity of the colorway of a shoe may vary with the material used for its upper or with the kind of material used for the colorway itself. The colorway of a shoe, not just the Gold sneakers last long depending on how the owner takes care of the shoe and maintains the vibrancy of its color. It also depends on whether the upper materials suit well with the elements of the colors and the kind of coloring material used for the shoe. Do gold sneakers ever go out of style? Every kind of trend always comes and goes. It applies to everything including shoes: its design and even its colorways. Gold sneakers display a bold and striking appeal that often only stays on trend at a particular span of time, but that doesn’t seem to matter as long as the wearer is able to style up their pair of gold sneakers and match it up with an appropriate set of outfit that keeps the footwear stay trendy. How to style up gold shoes? Shiny, metallic gold sneakers look exceptional when matched with a black and white combo look such as a white top and a black pants (skinny jeans, fitted jeans, etc.). Gold sneakers stand out in an all-black outfit. For women, it brings out a rather chic appeal. Wear bright or colorful socks with gold sneakers and let them peak out to capture attention. For a more relaxed and fun vibe, pair up gold sneakers with a neutral look. Gold sneakers look great with slightly cropped jeans as it also shows the beauty of the shoe. Match up a basic look with gold sneakers to add more spice.